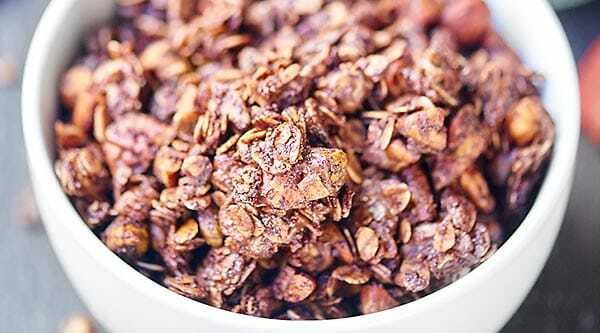 Double Chocolate Chip Granola. 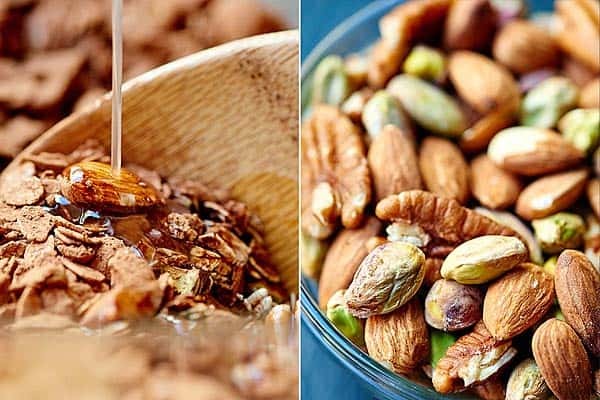 Healthy enough for breakfast, but indulgent enough for dessert! 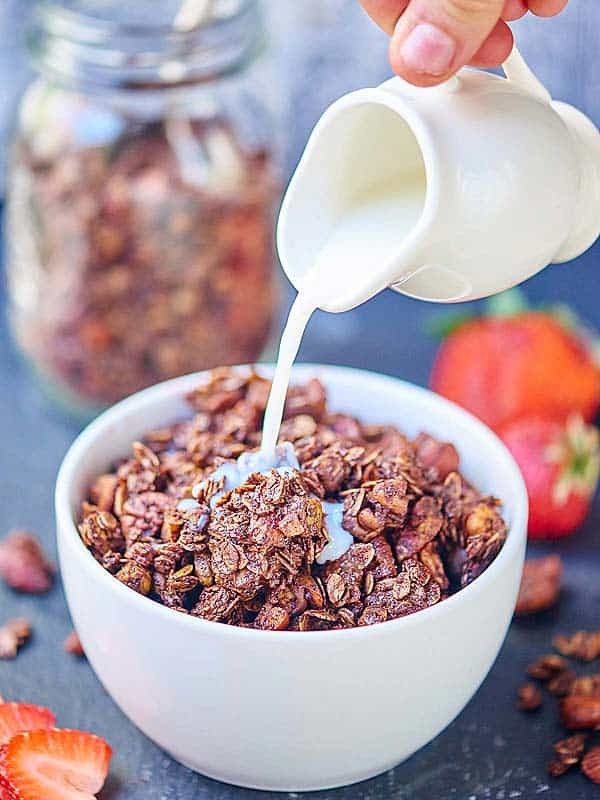 Double Chocolate Chip Granola is where it’s at! Holy yum this stuff is addicting. A few weeks ago, Trevor and I were going down to Portland and I wanted to give our friends Casey and Sondra a homemade gift as a “thank you” for hosting the three of us. Yes, we’re those dog people who take Teddy everywhere we can. I made this recipe on the day we left and it took every ounce of will power to not eat the entire batch. 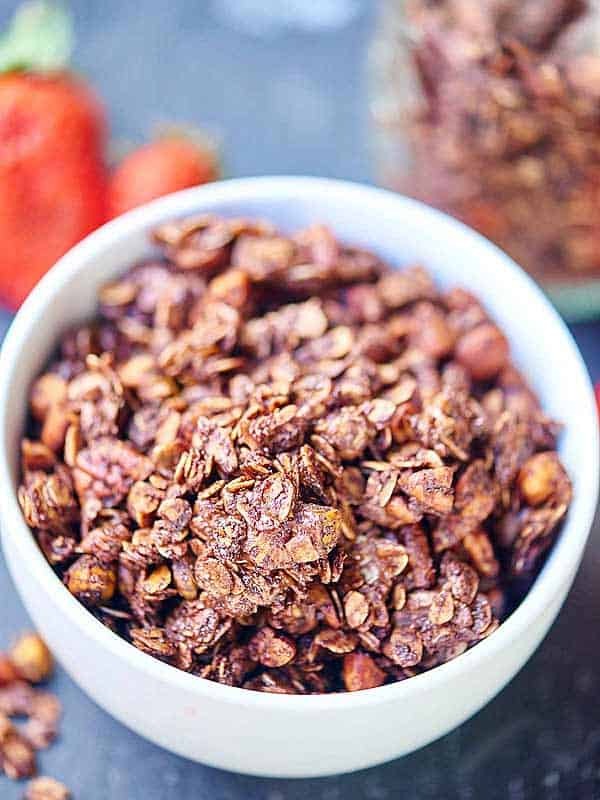 Luckily, this double chocolate chip granola recipe makes a ton. I gave some to my neighbors, but their dog ate it (ahhh! he’s fine though), gave some to friends, my hairdresser, ate more than I’d care to admit, and still had a full mason jar to give to our Portland friends. Can you blame him though…I mean…I’m telling you… this stuff is addicting! 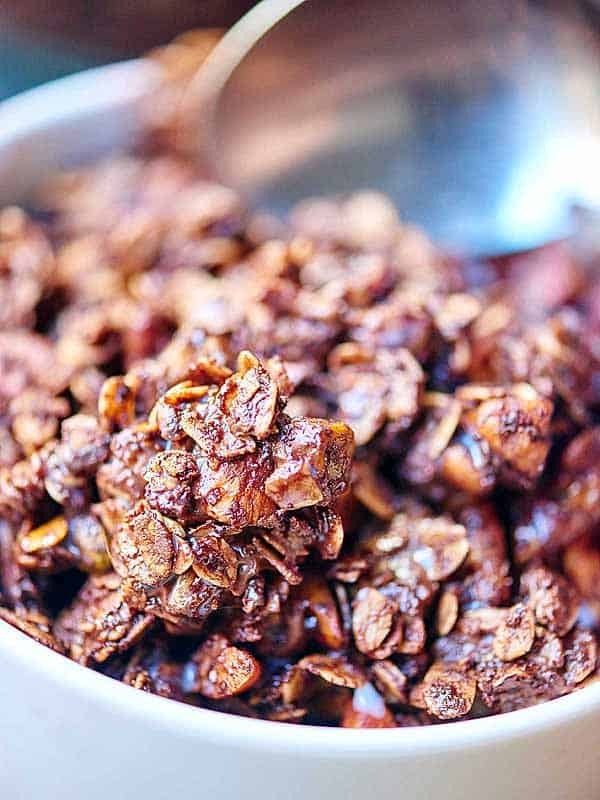 This double chocolate chip granola is so addicting and easy that you’ll want to share it with everyone, but at the same time hoard the whole batch for yourself and you’ll never get sick of it because there’s a million different ways to enjoy it. 1. Eat it for breakfast. 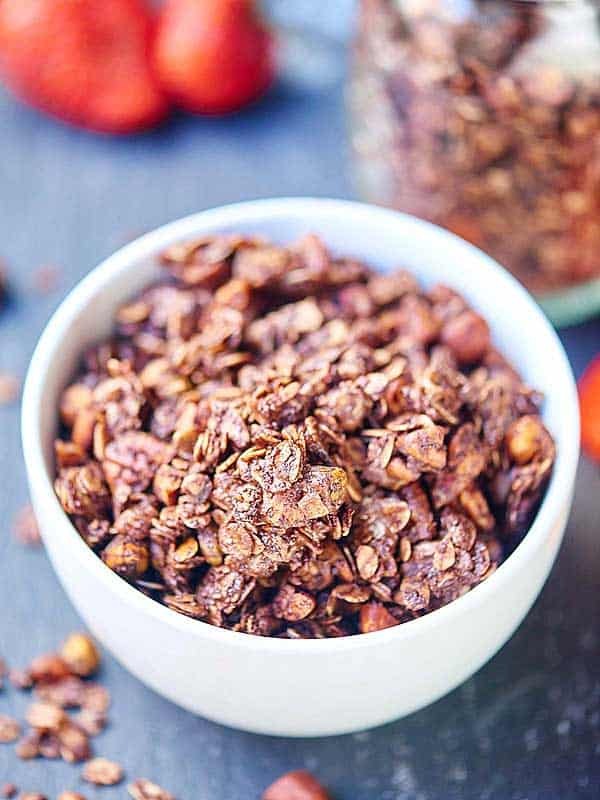 It will make you extra happy, because you’re allowed to eat granola for breakfast, but it tastes like you’re eating dessert. Have it with milk, over yogurt with some fruit, or plain. 2. Eat it on-the-go. I love keeping this in a mason jar so it’s easily portable! 3. Eat it for dessert. This says a lot coming from me, because I am really picky about my desserts. Extra fudgy, ooey-gooey one bowl brownies anyone? 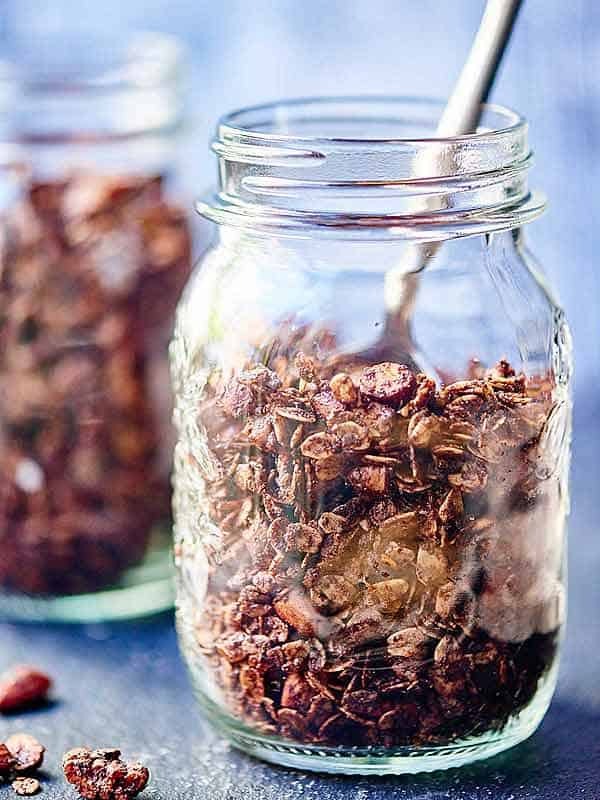 This double chocolate chip granola is killer on some ice cream and makes a perfect, slightly less guilt ridden dessert! Ok. 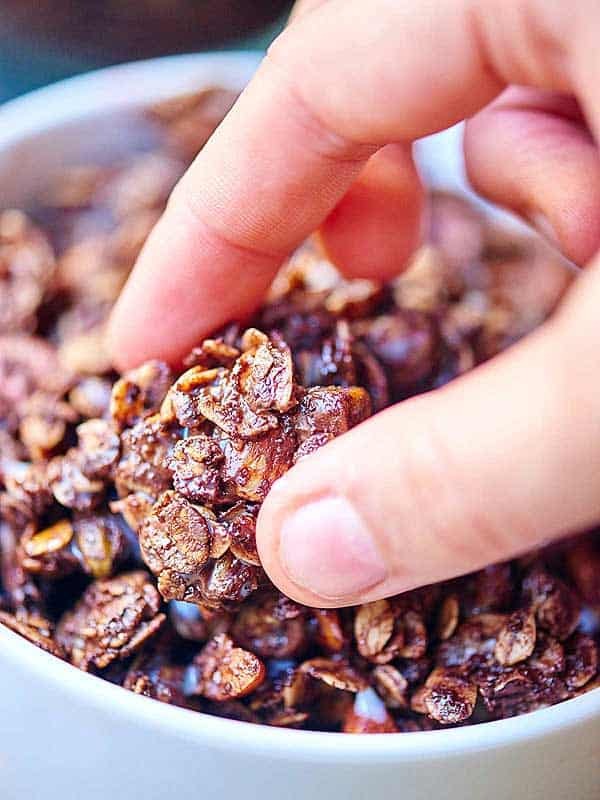 So that wasn’t a million different ways to enjoy this double chocolate chip granola, buuuut close enough. I promise you. 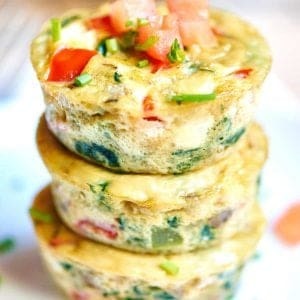 Just go make this now and you won’t regret it. 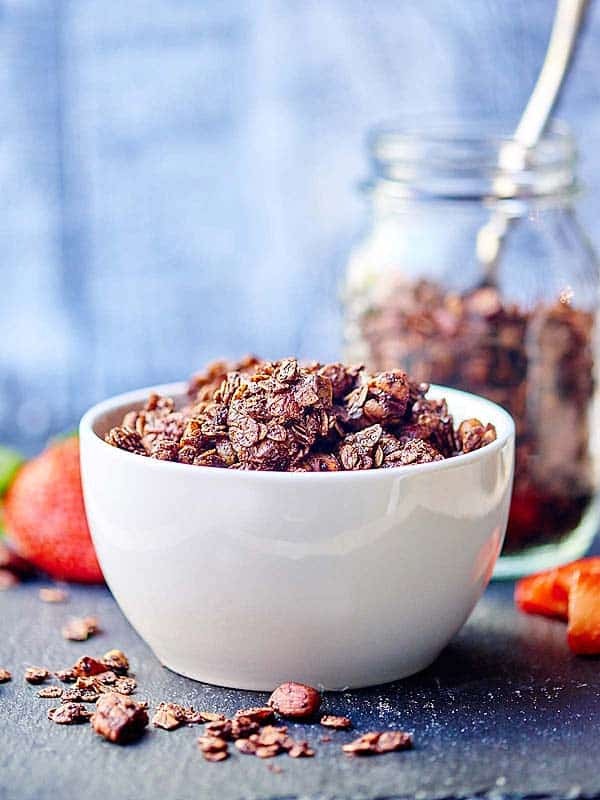 It’s extra chocolatey, crunchy, nutty, sweet, salty, perfection, yummy, oh-so-good, just can’t get enough, amazing…. Seriously. Go make this now, take a photo of it, and post it on Instagram! Make sure to add #showmetheyummy to your photo and tag @showmetheyummy so I can see how much you love it! Show me the yummy! 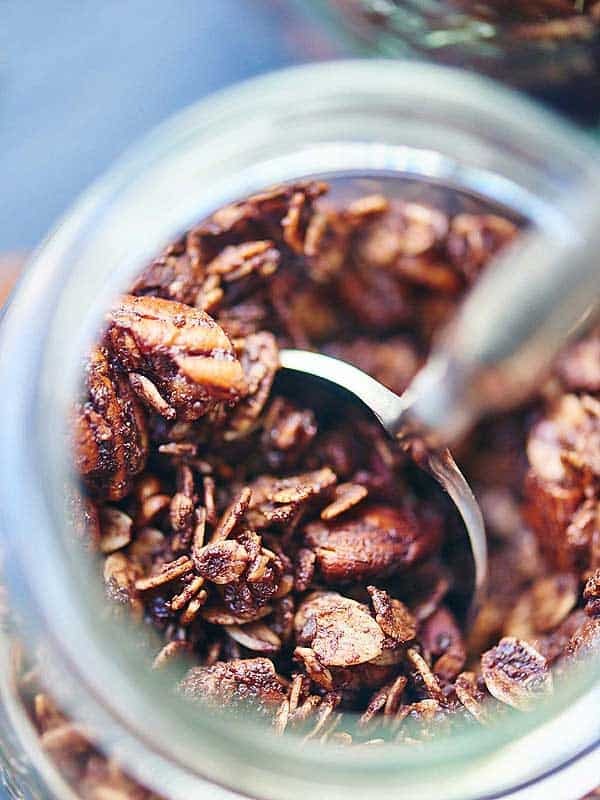 Mix oats, pecans, pistachios, cocoa powder, brown sugar, and salt together. Set aside. Whisk together the coconut oil, honey, and maple syrup until smooth. 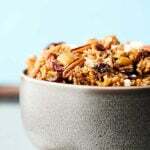 Pour the coconut oil mixture over the oat mixture and stir until moistened. Spread the mixture evenly on an unlined, rimmed baking sheet. It should be a thin, single layer. Bake for 40 minutes Stirring every 20 minutes. 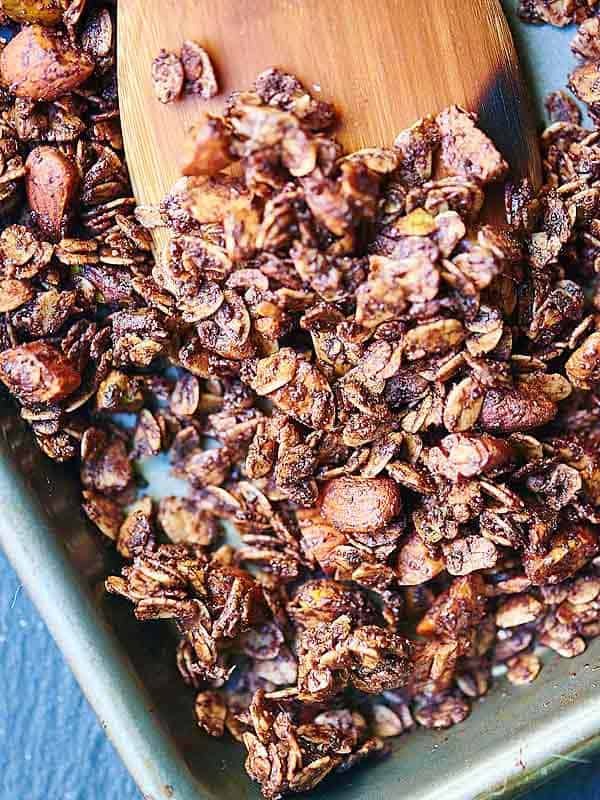 Remove the granola from the oven and gently stir in the semi sweet chocolate chips. Try to not stir too much, so you can get those really yummy clumps. Let it cool completely* and enjoy!